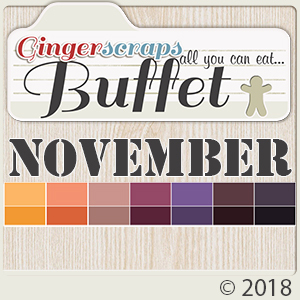 November has arrived so this means that The GingerScraps Buffet is now open and ready for your viewing/inspiration/crafting/and purchasing pleasure! The GingerScraps Buffet is an All You Can Eat .... or rather Scrap, Buffet. Each month the amazing GingerBread Ladies are given a color palette, and they will create delicious goodies for you. 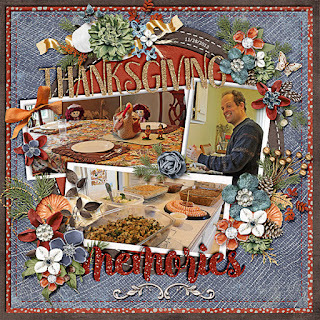 You can mix and match, 'till your hearts content! Think of it like a way to totally customize a Mega Collab, "eat" as little or as much as you would like. After all..... you can indulge all day long and it never counts towards your calories for the day. So hurry, go fill up your "plate" and feel free to come back for seconds! The best part…All products are on sale for 50% off for only a short time! You'll find lots of options to choose from in the store, so head on over to take a look!